U.S. mosques fearful of a backlash after the shooting rampage at Fort Hood, Texas are stepping up security. Nidal Malik Hasan, the man accused of opening fire at Fort Hood, Texas in a rampage that left 13 people dead and dozens wounded, is Muslim. A board member at All Dulles Area Muslim Society in Sterling, Va., contacted local police to ask for extra patrols. Friday is Islam's main communal prayer day. In the Chicago area, the Islamic Society of Northwest Suburbs of Chicago sent e-mails asking Muslims to be more careful. The Mosque Foundation president in Bridgeview says he's called police to put them on high alert. Zaher Sahloul says he fears something could be done to Muslims because of "misguided anger." His name had barely been released, his heritage and history not immediately known, but the reaction to the suspect accused in the Fort Hood shooting was fast and furious. 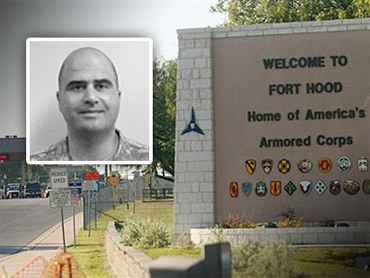 "Jihad at Fort Hood?" read the headline of a post on the Jihad Watch blog just moments after Hasan was identified as the alleged perpetrator of a mass shooting at the Texas military base that killed 12 people and wounded 31 others. "The name tells us a lot, does it not, senator?" Fox News's Shep Smith said while interviewing Kay Bailey Hutchison, a Texas senator. Hasan, a U.S. Army major, was initially reported to be among the 13 dead, but late Thursday, a U.S. Army spokesman said he was in hospital in stable condition, The death toll did not change, however, because one of the injured victims died in hospital. The Arab-American Institute said it received one threatening call from an unidentified male shortly after Hasan's name was released. The group, which condemned the massacre, said it expected more. The Council on American-Islamic Relations scheduled a Capitol Hill news conference on Thursday night to urge calm. "No political or religious ideology could ever justify or excuse such wanton and indiscriminate violence," the group said in a statement. "The attack was particularly heinous in that it targeted the all-volunteer army that protects our nation. American Muslims stand with our fellow citizens in offering both prayers for the victims and sincere condolences to the families of those killed or injured." Hasan was reportedly born and raised in Virginia, the son of immigrant parents from a small town near Jerusalem. He joined the military right out of high school, and the Army put him through college and then medical school, where he trained to be a psychiatrist. A cousin told the New York Times he started having second thoughts about his military career a few years ago after other soldiers harassed him for being a Muslim. He was also traumatized by the stories he heard from returning soldiers with post-traumatic stress disorder as he counseled them at the Walter Reed Army Medical Center in Washington and later, at Fort Hood. "He was mortified by the idea of having to deploy," Nader Hasan told the Times. "He had people telling him on a daily basis the horrors they saw over there." Robert Spencer, the director of the Jihad Watch blog and the author of nine books on Islam and jihad, chastised the media for failing to point to jihad as a possible explanation for the shooting. Elsewhere in the blogosphere, there were warnings of exactly that kind of backlash. "How long before some idiotic elected official declares Muslims shouldn't be allowed to serve in the military?" asked Salon's Mike Madden. The American Prospect's Adam Serwer beseeched: "Please, America, remember what kind of country you are right now." Josh Marshall, who writes for the TalkingPointsMemo blog, predicted "dark" times ahead. The fact Hasan is a Muslim "is going to be the focus of attention," Marshall wrote. The commenters on Jihad Watch were unforgiving in the hours after the shooting. "The war on terror is over, and the war on Islam has begun," one wrote. Al Siddiq, president of the Islamic Center of Waco, told the Waco Tribune Herald he feared a backlash, noting that all Muslims get lumped together when the unthinkable happens. He said the situation was especially painful because the U.S. Army has reached out to Muslims. "The Army has accommodated Muslims. Not any other army can offer what the U.S. Army offers," said Siddiq, who served as a U.S. soldier in Korea. "That's what hurts me the most."